Nowadays, companies are realizing that connecting with their consumers cannot be effectively achieved by marketing agencies or marketing gurus, but through the customers themselves. From heavy-weight brands like Fendi and Nike, to local stores are turning to social media influencers to get their word out there. The growing popularity of influencer-marketing, is due to its numerous advantages compared to traditional and other online marketing channels, which are gradually losing their effectiveness. Consumers are more inclined to trust their peers more than businesses because of their objectivity, authenticity, and similarity. The following paragraphs shed light on why influencer marketing has gained tremendous popularity in the past few years. Based on the data gathered by Nielsen, 90% of consumers rely on their peer recommendations to make purchasing decisions, while only 33% trust paid ads. Furthermore, 84% of consumers take actions based on an influencer-generated post, compared to other forms of advertising. 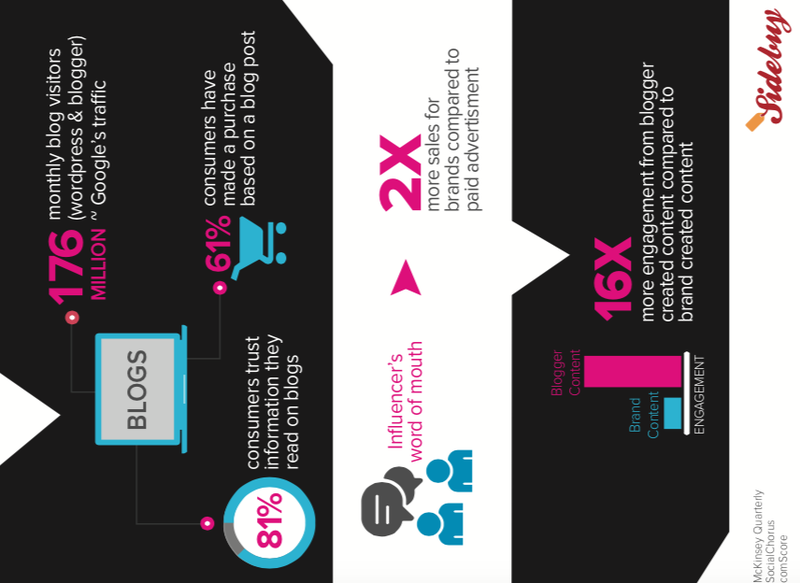 The authenticity and impartiality of blogger-curated content leads to higher levels of trust from consumers. Also, bloggers are often highly knowledgeable regarding the categories they blog about which increases their reliability and authority in the eyes of the followers. Building trust is crucial to developing long-term relationships between brands and consumers, and influencer marketing is an effective way to connect with customers in a personal way. It is challenging to develop unique campaigns that cut through the noise, grab people’s attention and convert them to customers. Because of the relevancy of content created by bloggers, followers are more prone to view the content, even share it with their own social followers, and in other words amplify the message. Whereas, when a retailer advertises through traditional channels, such as TV or newspaper, as well as online, such as Facebook or Google Adwords, the viewers are more likely to ignore the ads due to their intrusive nature. Based on a recent survey conducted by Sprout Social, 74% of consumers make a purchase based on what they find on their social networks. Also, as mentioned by Tomson, influencers can potentially generate $6.5 in revenue for every $1 spent. Influencer-marketing does not only generate higher profits, it also saves on the time and money spent on developing and implementing a campaign from start to finish. With this promotional channel, brands can turn their customers into brand advocates who can organically spread their message and amplify their reach. At Sidebuy, we are dedicated to building win-win relationships between community bloggers and brands seeking exposure through influence marketing. Not only we effectively match our members via our relevancy algorithm, we also help them to monitor and track the performance of campaigns with our data-driven and optimized platform.